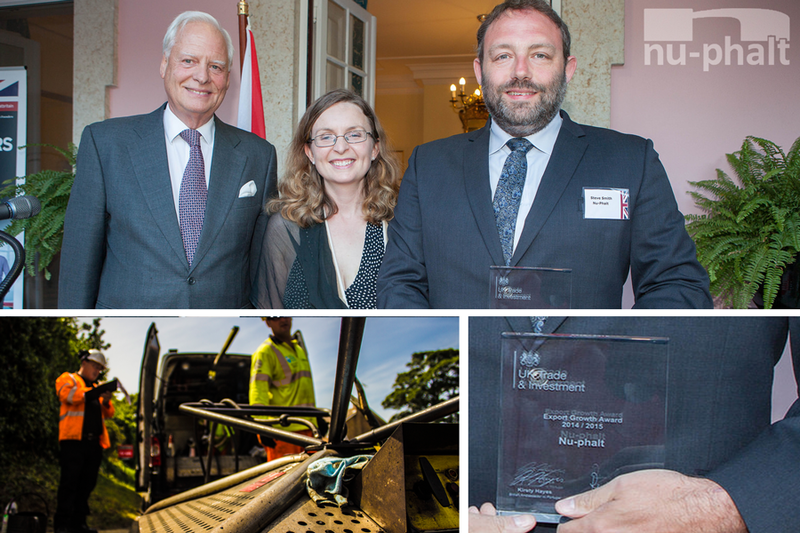 The award was presented to Nu-Phalt by Her Majesty’s Ambassador to the Portuguese Republic, Mrs Kirsty Hayes and Dominic Jermey, the CEO of the UKTI team. The UKTI organise annual business award events aimed at those Portuguese companies who choose the UK market as a destination of their international investment projects. It also celebrates with those UK companies who have achieved success in the Portuguese market, further enhancing the already strong trade and investment relations between Portugal and the UK, which is the heart of the awards. Nu-Phalt are based in Rugby, UK provide a leading road repair system to the UK Road Network. Over the last 10 years the Nu-Phalt group have developed innovative proven systems to help maintain and repair our roads, along with a contracting arm to provide services into local authorities and high speed infrastructures. “We provided Nu-Phalt with support under OMIS by identifying potential Portuguese partners, customers, and other stakeholders. This meant they could get a better understanding of the market, and relevant potential for business. We kept in touch as they undertook visits to the market looking forward to their first sale. This was considered crucial by all parties involved to get road contractors interested in their machinery. Once they see it operating and realise all the advantages there will be great potential for a substantial sales increase. Constraints on local authority revenue budgets have had a significant impact across the country on the maintenance needs of local road networks. The costs associated with the disposal of contaminated waste along with the complexity of undertaking safe and environmentally friendly repairs on tar contaminated roads, has taken the issue to centre stage. Within the UK tar has been used in road construction in all pavement layers (including surface dressing) up until the mid-1980s. Many of these roads now require treatments such as surface dressing or micro surfacing to extend the life of the carriageway and to ensure that these surfaces meet the service life permanent patching must be carried out prior to these surface treatments. Road tar is a complex mixture of hydrocarbons and can be differentiated from bitumen by the presence of short chain polycyclic aromatic hydrocarbons (PAH). Some PAH types have been identified as carcinogenic and must be met with extreme caution. Asphalt waste contaminated with coal tar (AWCCT) is classified as Hazardous Waste under the European Waste Catalogue (EWC). AWCTT has to be disposed of at an approved hazardous waste to landfill at great expense to local authorities and the environment. 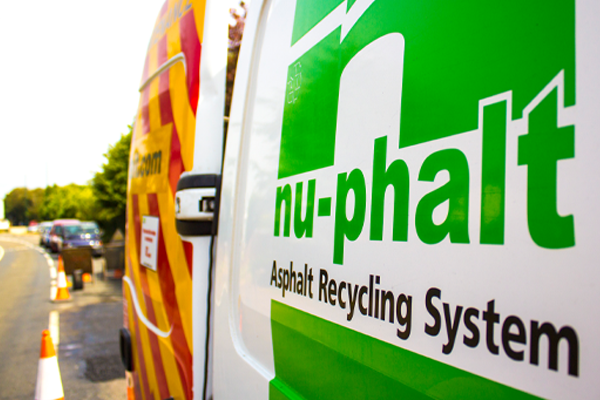 Nu-Phalt’s unique thermal patching process provides a cost effective solution whereby the road surface can be recycled and a permanent in-situ repair can be undertaken thus avoiding costly hazardous waste landfill. In late 2015, Nu-Phalt Contracting Ltd commissioned independent testing by Environmental Scientifics Group Ltd (ESG – one of the UK’s leading provider of testing, inspection and compliance services) to undertake personal exposure monitoring for Total Inhalable Dust, Bitumen Fume, Polycyclic Aromatic Hydrocarbons (PAHs), Volatile Organic Compounds (VOCs) and Gas monitoring during thermal road repair works on locations know to contain tar. In addition, static sets of samples were taken downwind of the operating area in order to monitor any possible exposure to fumes to members of the public and or nearby residents. The results indicated that exposure to all other parameters monitored (Bitumen fume, total inhalable dust, VOCs and combustion gases) were all well below any relevant exposure limits. The results also indicated that all parameters monitored, including PAHs, were all below relevant exposure limits at the static downwind location. Although static samples should not be compared directly with exposure limits, the results indicate that exposure would be unlikely to be significant, even if a prolonged period was spent at the static location. Asset Managers now have a realistic sustainable alternative to maintaining the longevity of their network, promoting a green recycling philosophy, whilst reducing the environmental impact of Hazardous Waste Landfill and secure in the knowledge that operatives and general public are safe whilst using the specialist innovative thermal pavement repair system.